After a shortened training time of two and a half years, two TecAlliance trainees successfully passed their final examination before the Chamber of Industry and Commerce in February 2016. 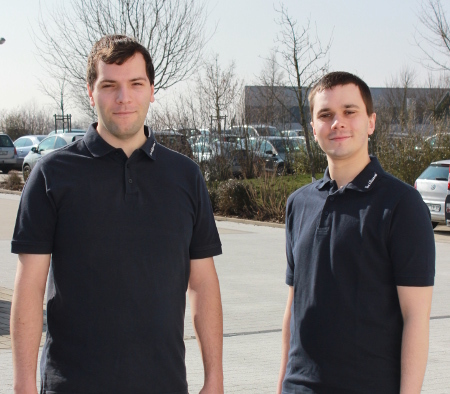 The budding IT experts with a specialisation in application development, Lukas Walther and André Berberich, both achieved the overall grade “very good” and will remain with the company. Lukas Walther (right in picture) and André Berberich are delighted to have successfully completed their training. Lukas Walther is supporting the Quality Assurance department, while André Berberich will begin a dual study course at the Baden-Wuerttemberg Cooperative State University (DHBW) Mosbach starting in October. The two IT experts began their training at the Weikersheim site. During the training period they became familiar with the Software Development, IT Operations and Quality Assurance departments and also worked at other company locations. 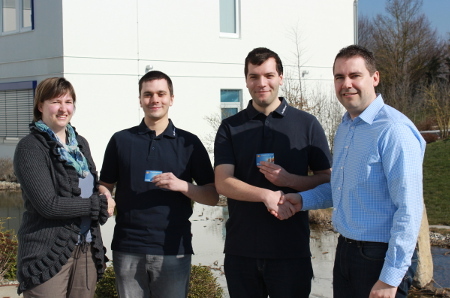 Training Leader Kerstin Langohr and Jürgen Weiland, Vice President of Software Development – Information Management Solutions (far right in picture), congratulate the two fledging IT experts in application development. For 2016 and 2017, TecAlliance still has open training places for IT experts with a specialisation in application development and system integration as well as for the apprentice occupations IT System Management Assistant and IT Management Assistant. There are still places for high school graduates in a dual study course at the Baden-Wuerttemberg Cooperative State University (DHBW) Mosbach to begin in 2016 for the degrees of Bachelor of Science in Applied Information Technology and Bachelor of Science in Business Information Systems. Future students are still being sought for studies starting in 2017 leading to the degrees of Bachelor of Arts in International Business (Industrial Sales & Marketing), Bachelor of Engineering in Business Engineering (Technical Sales Management), Bachelor of Science in Business Information Systems as well as Bachelor of Engineering in Innovation and Product Management. More information can be found on the TecAlliance website.